After slowly weaning myself off mango over the past month or so, I fell right off the wagon after spotting this exotic margarita mix at the local TJ's. Sonia and I weren't able to make a Princeton run (the closest Trader Joe's store that sells alcohol) for TJ's brand booze, so we made due with an off brand, and we whipped up a batch of blended margaritas to help beat this summer heat and humidity. Unlike quite a few of the offerings we saw earlier this summer, this is a product that actually should be mango-flavored. It's a sweet, candy mango taste that blends well with tequila. Margaritas are a uniquely-summery beverage, and they lend themselves to uniquely-summery flavors like mango. To me, it seems much fruitier and juicier than its lemon-lime predecessor. Of course, both flavors are good, but in a way, I think this one works even better. Who knows? 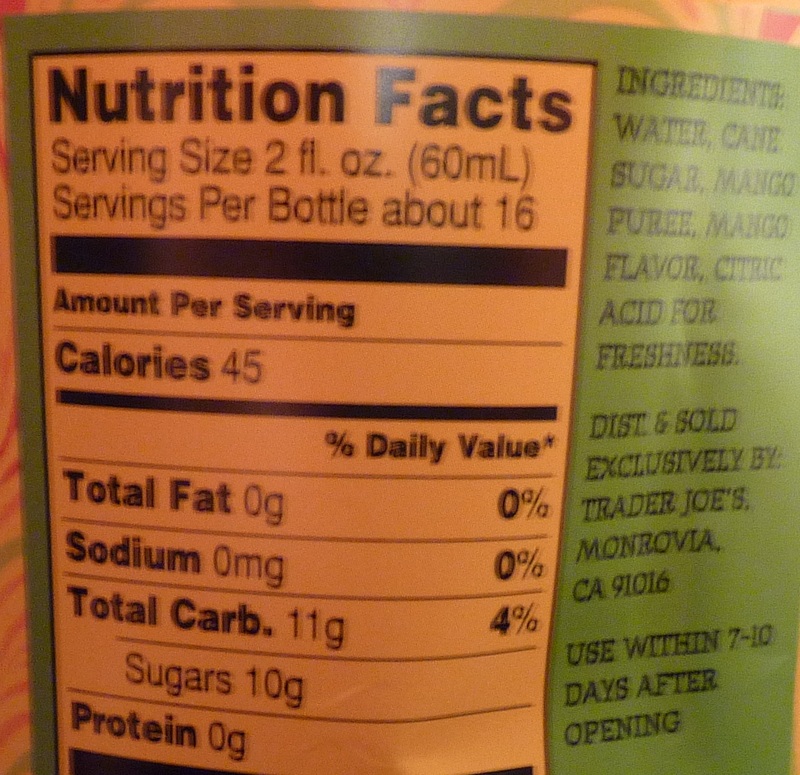 This product may actually pre-date the recent onslaught of mango insanity at Trader Joe's. Somehow it just doesn't seem as forced as products like mango sandwich cookies and mango chia pudding. Also like the previously-reviewed traditional flavor, this margarita mixer uses simple, natural ingredients. 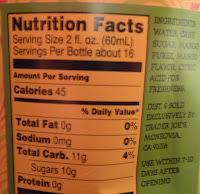 If there's anyone else out there who enjoys margaritas and also tries to avoid high fructose corn syrup, I'm sure you've discovered that it's virtually impossible to find margarita mixer at a normal grocery store that uses actual sugar in its ingredients—and in the rare case you do find it, it costs an arm and a leg. This stuff is only $2.69. By itself, the mixer is very thick and way too sweet. It needs to be diluted significantly. I think four ice cubes and one shot of tequila per two ounces mixer works best, but it's also decent as the base for virgin cocktails with only water/ice and maybe a lime wedge, as suggested on the label—so, yes, the kids can enjoy this one, too. Mangoritas taste like summer. Double fours. This was sold out by late June in my local Trader Joe's! I managed to buy three bottles but that was it. Sigh. But you can make a decent mango margarita with their small cans of pure mango juice and fresh squeezed lime...and it's not as sweet as the mix. Good to know! Thanks, KeriL. I recently found your blog and podcast and love it as my wife and I are also TJ fanatics (although we also split our grocery shopping between TJ and Whole Foods - ever notice how many of them are within a mile or two of each other?). I did want to just say hi and was curious if you tried pairing this mango mix with any other spirits? I'm thinking it might work well with vodka. I don't really drink Tequila anymore (bad experiences!). Hi Chris. Thanks for reading, listening, and commenting! We rarely buy hard liquor. Tequila for margaritas is the exception to the rule for us. So no, we've never tried this mixer with anything else. But vodka is pretty neutral, so I think there's a good chance it would work.